According to IDC surveys, the mobile hardware manufacturers have shipped 344.3 million smartphones worldwide in the first quarter of 2017. It indicates the unprecedented growth of mobile devices and usage trends for smartphone-like affluent devices. Moreover, mobile devices are always increasing its CPU power, Storage capacities, battery life, and additional hardware as well as software to support and run high-end applications smoothly. The evolution in the mobile operating system, hardware, and software has opened the new doors of opportunities for mobile application developers to offer more intricate and functional applications covering diverse industries/niches and their unique needs in absolutely innovative ways. Therefore, it has given birth of myriads of location-based mobile apps relying on a variety of location-based technologies such as GPS at first place, Bluetooth-based Beacon and iBeacon, and NFD-based secure transaction/transfer applications. Similarly, hardware, CPU, and power specific Augmented Reality and Virtual Reality technologies. Beyond the mobiles and computing technologies, the Internet of Things (IoT) applications awaiting several innovations to enter fully into the mainstream. Fortunately, with the pace of time such amazing and innovative technologies have started to get trendy for the past two or more years and showing somewhat mature trends in the current 2017. We are at the tail portion of the year 2017 and people are expecting experts to forecast the technology trends for upcoming 2018 year on the eve of welcoming the New Year. Thanks to inherent obedience, we also try to serve some pieces of grand cake on the table via the current post. I have already mentioned some significant trends before in the form of the outlines of the upcoming tech revolution. Therefore, I would like to expand it further in the next sections one-by-one to paint a big picture on the canvas of the web. Virtual reality or VR applications enjoy a big share in the market well before a few years. However, graceful entry of Augmented Reality promising big and bright future without any trace of doubts. If you look at the recent development on the front of Apple Inc. and Google team, it deliberately supports my assumptions. Before a month, tech market has noticed news, “Apple is ramping up work on AR headset to succeed iPhone” as the indication of new development and trends. According to that news, Apple has formulated a team of several hundreds of engineers at Dolby Labs working on some secret projects under the umbrella code name-T288. The first release by the team was ARKit, a toolset or SDK to create AR application for third-party developers for the latest versions of iPhone and iPad. As the next step, the team had developed a headset with a built-in display, which was capable of showing streaming 3D video saving battery drainage. Apple also has developed a chip to power its AR headset. The motion tracking to estimate phone location based on the internal sensors and video footage. The environmental understanding to detect flat surfaces. Google has left the doors open for experienced AR app developers to use Java, OpenGL, Unity 3D/4D, and Unreal, and for the fresher, it has AR core objects from the Tilt Brush VR painting app. The next plan of Google is to combine the capacities of ARCore with Google Lens to offer innovative visual search experiences on its search engine. Pokémon Go has established the supremacy of Augmented Reality in the gaming industry. Apart from the games, AR app developers like SysBunny look other fields to explore for AR opportunity. Those are with an estimated market share in next decade. If we revisit the Pokémon Go game to see other technologies used in the app development and functioning, it is LBS, with GPS capabilities. It indicated the share of LBS in the app development market. 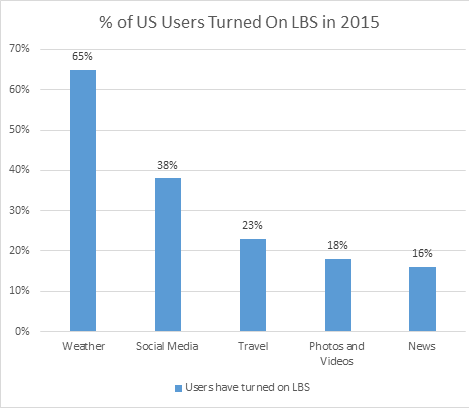 According to a survey by eMarketer.com, nearly 74% the USA smartphone users have benefited LBS in 2013 and 2015, it reached up to 90%. Artificial Intelligence relevant machine learning technologies have turned the table of user experiences in favor of mobility. The speech recognition app Siri by Apple and other similar services on other platforms are the best examples of it. We know the value of customer insights for a business to take right decisions, formulate & implement marketing strategies, and manage the business operations, which are solely customer-friendly. For a few years in past, we were dependent on Big Data and analytics to gain customer insights. Fortunately, artificial intelligence and machine learning have provided innovative ways to dig customer insights in altogether different ways and made it contextual as well as real-time. According to a report by Forrester.com, Adobe, Google, IBM, Persado, Salesforce, and Squirro are investing heavily in the development of cognitive computing for applicable AI and machine learning solutions. Compared to 2016, the investment on AI in 2017 reached 300% high. It believes that AI has more potential to grow in 2018 and beyond. In 2016, Google Now and Prisma are AI capable app adventures and 2017 had witnessed AI capable Chatbot applications growth to promise bright future in 2018 and beyond for Omnipresence retailers and online businesses. The IoT is a vast sea of the big scale implementation of mobile and hardware embedding technologies to connect the devices in meaningful ways. The dependencies of IoT applications on mobile devices and mobile apps are great and use to control the IoT enabled smart devices or machines. The IoT technology has provided some awesome solutions in recent past and the current year 2017. For instance, smart homes, cities, connected cars, smart healthcare, smart energy, and smart transportation systems. The tech experts at Forbes.com have predicted following IoT trends, which are also favoring mobile app growth based on IoT applications. Enterprises are early adopters of IoT applications that consumers and retail businesses. New European guidelines have given the green light for the IoT data commercialization. Marketers are looking for more opportunity to provide brand experiences using IoT applications and AI-powered digital assistants like Siri, Alexa, Cortana, and Google Assistant. IoT enabled mobile devices to provide immense possibilities to connect the local data generation to cloud services. Health technology is expanding from simple tracking to prevention and healing operations thanks to IoT application infusion. More than 5% rise reported on Blockchain based IoT apps. Nice Post Micheal!! Mobile commerce will surely see a lot of changes in the coming year. MichealJones is Senior iOS/iPhone/mobile app developer, ready to help you overcome app problems, questions, App Store ideas, and validation.